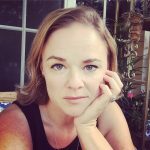 My first One Room Challenge, hosted by Linda at Calling It Home, has been just that – a massive challenge. It’s time for the Kitchen Reveal – but I’m not quite ready yet! Eek! Maybe I should have started with an easier room?! Or possibly picked at better time than when we are trying to sell one house and get the other one ready to move into? LOL! What was I thinking?! Remodeling our entire kitchen was a lot to take on. When we bought the house, we weren’t planning on replacing the kitchen at all, so being completely honest, I’m surprised that I was able to pull this much together in six weeks! We had a few setbacks and delays, and a couple of really cruddy things happen (like buying a busted fridge and not getting all the money back!) But we also had some seriously amazing things happen too – like finding a clearance dishwasher for $134, marked down from $899!! Even after all the issues we came up against, we are soooo close to being finished! As things get completed, I’ll update this post with new pics and details. 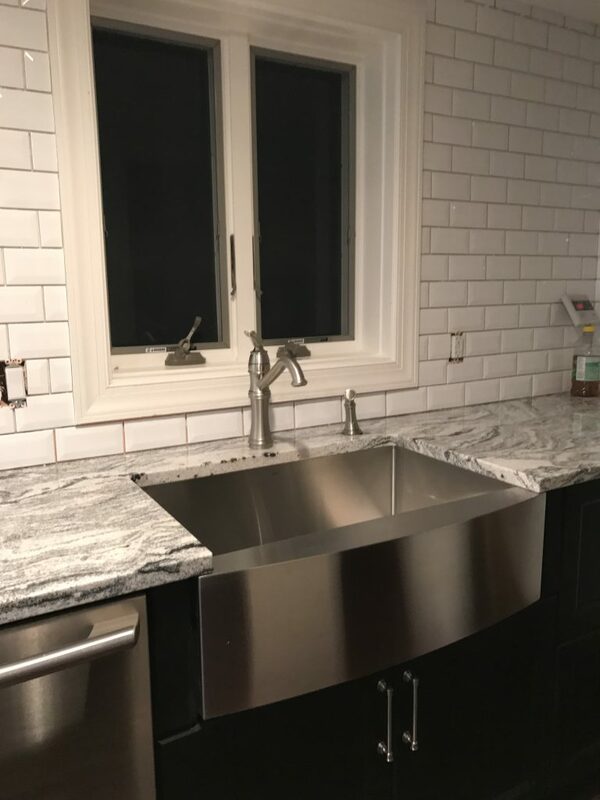 I’m hoping for most of the big stuff to be finished this week – like the backsplash and getting the broken fridge replaced! As you can see above, the backsplash on this side isn’t finished. If you follow me on Instagram, you’d know we ripped out two different backsplashes this week – one was just a few feet of tile, the other was two whole walls! I’m still waiting for the drywall patch to fully dry in the areas where we had to remove the tile and ended up removing much of the wall with it. See where it’s still slightly pink? Yeah, that’s where the holes in the wall were so deep, I probably should have ripped it completely out and replaced those pieces. Ugh. Live and learn, right? What tiling I have finished already is fabulous though! I still have to grout this area, but I love, love, love the way it looks already. And I do have to admit that doing this backsplash myself instead of hiring out, has made me appreciate just how hard this job is! This experience has taught me a lot, like don’t be afraid to start over, always have a back up plan, shop early, don’t count on anyone else to be as worried about your timeline as you are… I could go on, but you get the picture. 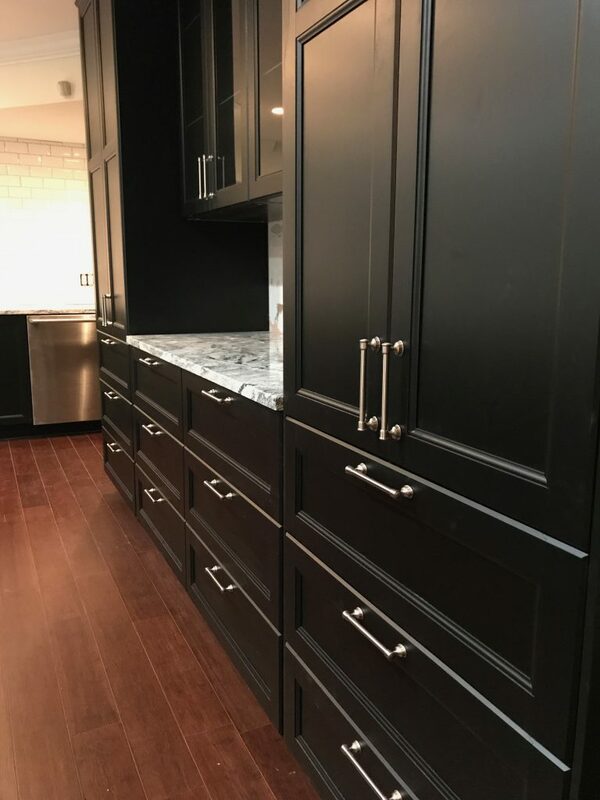 Give me a few days to finish up, take some beautiful pictures, and add the info for all the products we used… I promise you won’t be disappointed by the final kitchen reveal! But for now, it’s 2 am, and I need to sleep. you guys have made amazing progress! the tile is so awesome, and i love everything so far!!! Your kitchen looks great so far. You did an amazing job with those tiles as well. Good luck finishing. Thanks! The tile is taking forever, but one more day and it should be done! That island! Stunning. Kitchens are a huge project, you made great progress already! Hang in there girl! You got this! 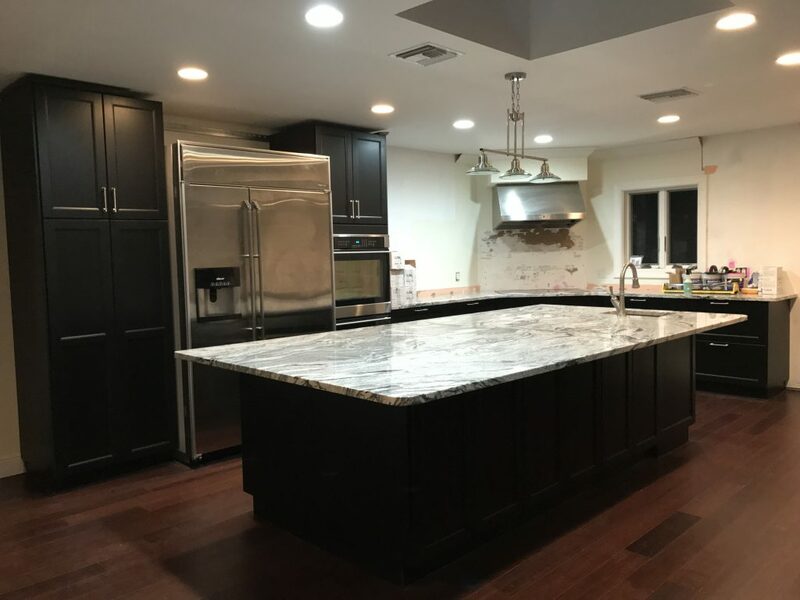 Your kitchen is looking amazing! Thanks! Can’t wait to finish!! I love the direction your kitchen is going in! Those cabinets are to die for. 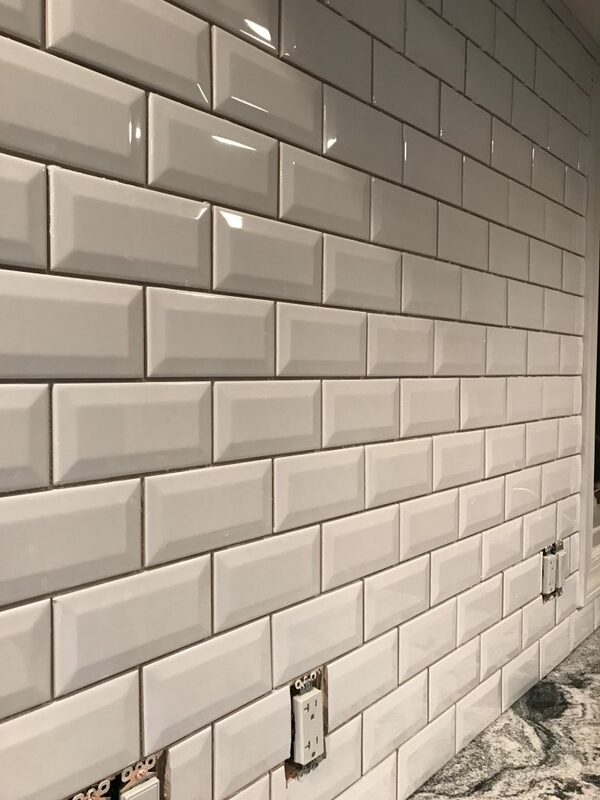 And the subway tiles look great. I feel your pain with the tiling effort 🙂 Can’t wait to see the finished project. Thank you! I’m getting excited seeing it all come together! Looking good so far can’t wait to see it all finished!! You and me both! 😆. Thanks! Its completely amazing!! I totally love it! Great work!! I’d be extremely happy with that progress! A kitchen reno is a HUGE project to take on and from what I’m seeing so far… it’s going to be amazing! Your kitchen is going to be so amazing when it’s done! It’s already beautiful! I love the tile! It’s looking amazing! Can’t wait to see everything soon! This looks so good! To your defense, you had a KITCHEN REMODEL to do in 6 weeks. I see your vision and so far, everything looks so good. It looks like a whole new kitchen. Also, I am totally digging your tile! Thank you!! It’s coming along this week – hope to be done soon!! I love love love those black cupboards. 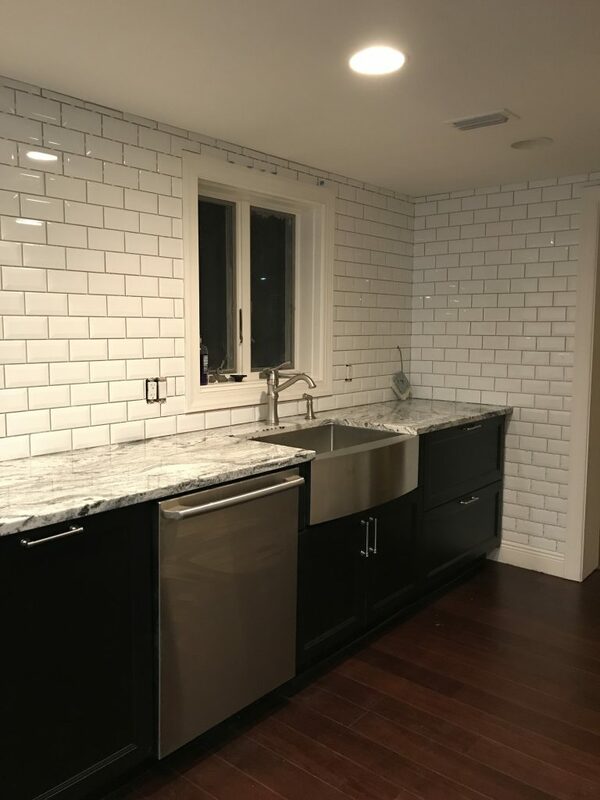 The white tile DOES look fantastic (even without the grout) so I can’t wait to see it all completed! Thank you! It’s getting there. 😊 Hopefully tomorrow I will finish that tile! Nice find on the dishwasher! I love how the kitchen looks so far.